I made a 4s battery pack made of 18650 LiFePO4 cells that I'm planning to use for a mobile computing hobby project. My plan for charging it is to use a salvaged power supply from a computer along with a boost converter on the 12 V rail to push the pack pack to around 14 V at "full" charge. Max charging voltage according to spec is 14.6 V (3.65 V/cell) but I've read that slightly under-charging dramatically increases lifespan, which is desirable in my use case. When initially assembling the pack I charged it on a bench power supply directly, until the pack was 13.3 V. Thanks to the power supply's gauges and dials I felt comfortable manually dialing in the current, etc for the initial charge. After that, I finished the pack by hooking up a 4s protection circuit (https://www.amazon.com/4Series-Protection-Balancing-LiFePO4-Battery/dp/B07511RJ9S) and connecting all of my sensor wires and load-bearing wires according to the diagram pictured here. Now that I'm trying to charge through the protection circuit, nothing seems to be happening. I've set the open-circuit voltage on the boost converter from 14 V to 14.6 V and no matter what I do I'm always seeing 13.3 V (pack's current resting voltage) across the boost converter's terminals. Waiting a while doesn't change anything, and I'm paranoid that I'm going to fry something just letting it sit powered too long or without supervision. I don't have anything connected to the BMS load terminal. The charge terminal of the BMS is connected to the Vout- terminal of the boost converter, and the battery pack's positive lead is connected to the Vout+ of the boost converter. The boost converter's Vin- and Vin+ are connected to the PSU's GND and +12v rails, respectively. I haven't tried going back to the hobby shop and directly charging through the BMS with the bench power supply. Would that be a good step to eliminate some problem with the BMS board? I'm not sure how often those come out bad, and I'm pretty certain I've got it wired correctly. If nothing else it would let me see if I've got any current flowing. The ammeter setting on my tester is finicky, and I don't trust it. 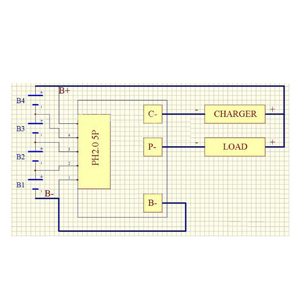 Is this inherent to how a boost converter would work ordinarily? If being connected to a power source causes the boost converter to freeze at that voltage then I'm going to have to figure out some other way of putting together a charger. I was under the impression that by pushing a higher voltage than the battery had, it should cause current to flow back into the battery. I realize I'm going about this the hard way, but building it from scratch is part of the fun. Please no "buy a charger" replies. I may end up going that route, but until then I'm here specifically to troubleshoot my efforts at making one myself. I can try some different things, including hooking up a 12v fan as a load, if anybody needs me to in order to eliminate potential issues. Browse other questions tagged battery-charging boost lifepo4 or ask your own question. How to fast charge a Lifepo4? How to slow charge multi-cell Lipo battery from USB?